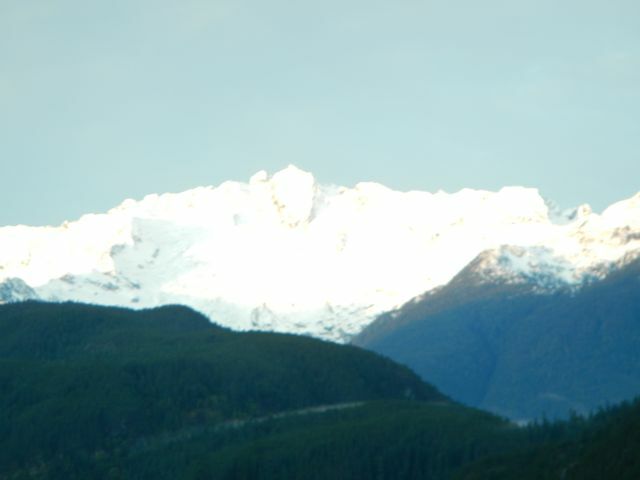 Driving down to Squamish was beautiful with the sun pinking the sky behind the brilliant white peaks lining the Sea to Sky Highway, a view that was shrouded in cloud on our drive up the Whistler. We met Clint at a coffee shop where we picked up a couple of sandwiches and bottles of water before we headed out to our fist stop. Seemed like everyone on the river fishing that day knew Clint. He recognized a buddy’s truck and after we got into our costumes (and they say only girls do the dress up thing), we headed down to the river to see what kind of day it was. Clint’s buddy told him that the fish weren’t too interested in biting. What they seemed to be interested in was spawning and dying, but that’s just my opinion…probably jaded because I didn’t catch anything. 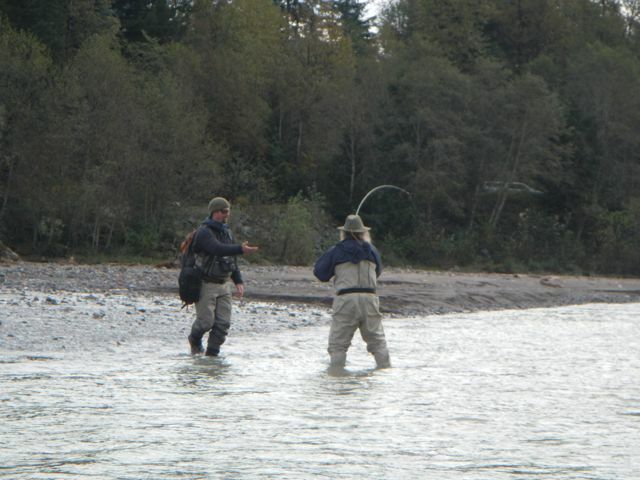 We were fishing for chum and coho. Mr. Al’s first catch was a randy pink. I stood in the river pretending like I knew what I was doing but the fish saw right through that. Most of the pinks were at the end of their 2-year life cycle and into the spawning thing. Those that had completed their spawn were flapping listlessly–battered, mottled with fungus, and disintegrating even before they were dead. Some of the gulls had already pecked out their eyes. Not a pretty sight, and I took no pictures, so you have been spared. Thousands upon thousands of dead and dying fish. Everywhere. Lining the banks with plenty of gulls and other scavengers eating their fill. The other side of the circle of life. On a good note, this was the largest recorded spawn of the pinks. If there were thousands of carcasses, there were millions of eggs. 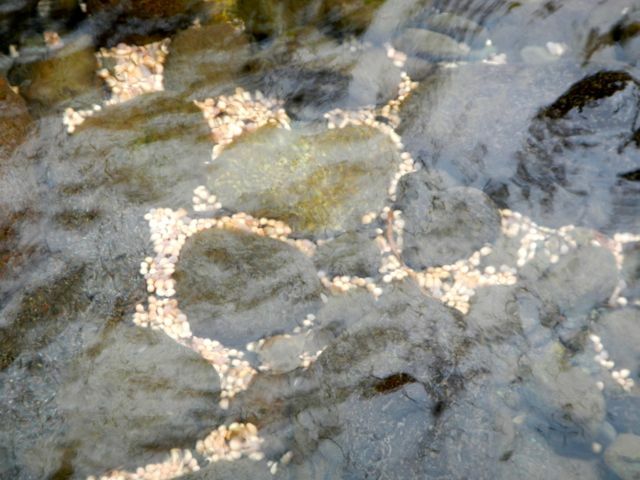 Eggs everywhere, which was good for those who fed on salmon eggs like the trout who would get nice and fat and stay healthy over the winter. And the pinks, the sly little guys, would hatch around February in the afternoon and sneak back to the ocean that night while the trout were busy with their own spawning season. Spawning trout, in case you didn’t know, weren’t so dramatic as the salmon. They lived to spawn another day. 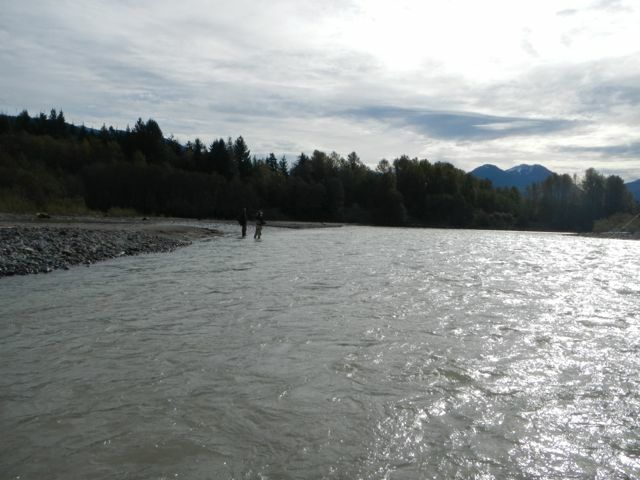 Back to fishing…I loved standing in the river, bracing against the current and the occasional zombie fish that would swim into me. I learned a lot but caught nothing. Not the point, Clint told me. The point was being out with Nature. If fishing were that easy, it would be called catching, right? Probably why nets were invented. Whatever, Mr. Al caught fish and that was important to me. I’ll get plenty of chances and I had the opportunity to practice different types of casting in different types of situations. Clint’s a fantastic teacher. 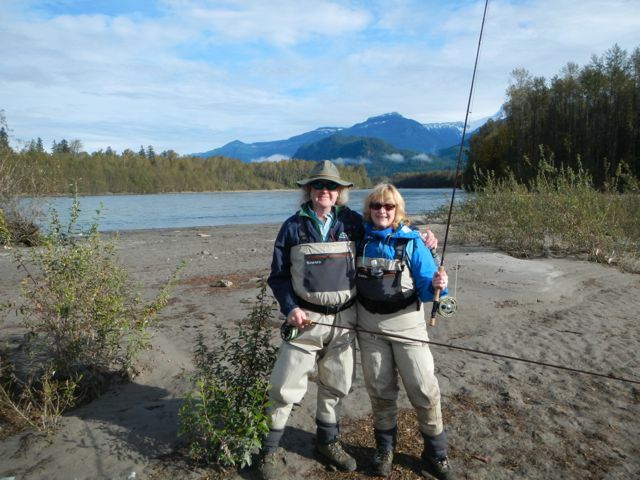 We fished for a time at the mouth of the Squamish river and then relocated to a trout stream. Again, thousands of zombie fish. It really was mind boggling how many there were. Oh, and did I mention the smell? Now, i have. We used wet flies and dry flies. 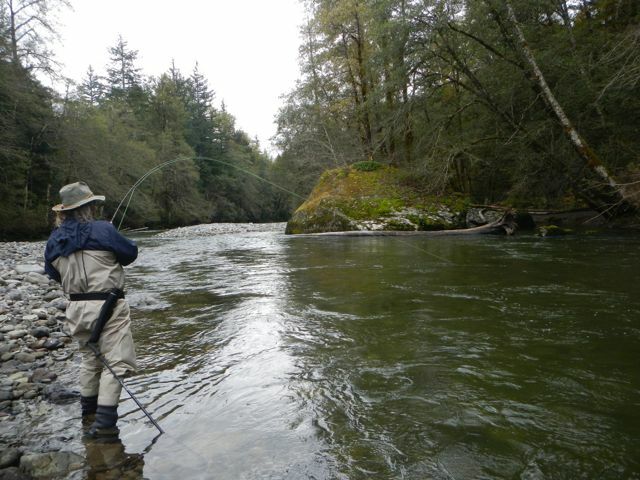 Fishing with the dry flies was the most fun because the fly floats on top of the river’s surface and you can watch the fish attack. There was a little window of time where moths started hatching. During that time, the trout stopped eating salmon eggs and started eating the moths on the surface of the river. 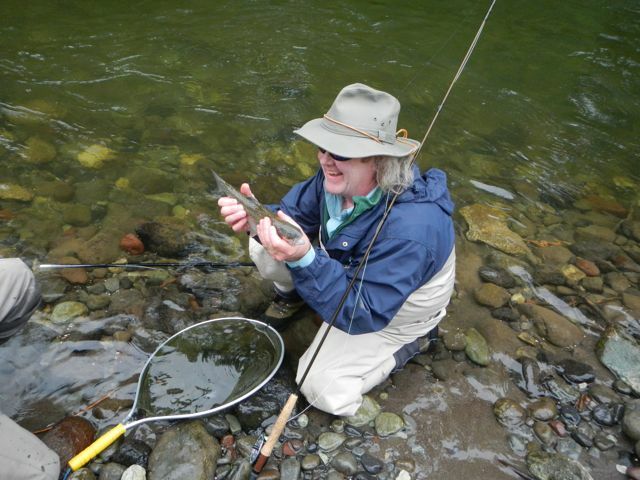 When a dry fly is offered just right, the trout accepts and there’s a frisky fish on your line to play with. Really fun to watch. The trout Mr. Al caught were all fat and sassy, which really pleased Clint because they were going to winter well. It was a good day. The rain held off and we saw osprey, gulls, a seal and, yes, zombies. Looks wonderful! Pix are mouthwatering, but will have to read later because from the bit I skimmed through I’m gonna want to concentrate and I’m crunching right now. Thanks for the pics and description. I didn’t know that spawning fish died soon afterwards. 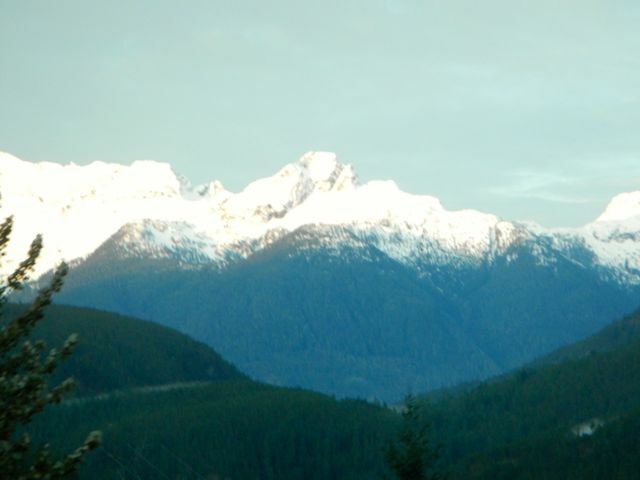 What a beautiful place!! !